The good news is you are no more required to give details of foreign trips or expenditure thereon to the income-tax department. But you still need to give your passport number, if available, in Forms ITR-2 and ITR-2A. This is the time of the year when people run around to file their income tax returns. This year, however, you could take things easy as the deadline has been extended to August 31. The controversial and cumbersome provisions for mandatory disclosure of expenditure on foreign trips and bank balances have been dropped. New provisions have also been introduced, but in a much simpler form. The forms that were notified last month were withdrawn given widespread opposition for stringent disclosure norms. People opposed the idea of sharing information about foreign trips and bank balances. The new forms have done away with detailed disclosures but they still ask for information on your foreign trips and bank account albeit indirectly. Considering that many taxpayers have more than one house property but do not have capital gains, the finance ministry has proposed a new Form - ITR-2A - to simplify the process. 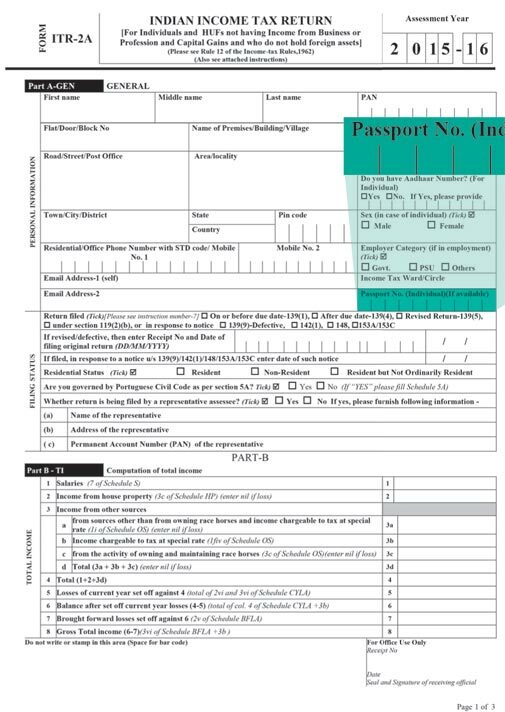 The form is for an individual or HUF with two house properties but no capital gains, income from business/profession or foreign asset/foreign income. The good news is that Form ITR-2 and the new Form ITR-2A will not be more than three pages, and information will be captured in the schedules if applicable. The good news is you are no more required to give details of foreign trips or expenditure thereon to the income-tax department. But you still need to give your passport number, if available, in Forms ITR-2 and ITR-2A. Experts say it is like window dressing as the income-tax department can still get information about your foreign trips from the immigration department. Earlier, you used to give details of only one bank account for refund purposes. Now, you will be required to give details of all your active bank accounts held at any time during the previous year. You will need to fill the IFS code and number of all current/savings bank accounts. 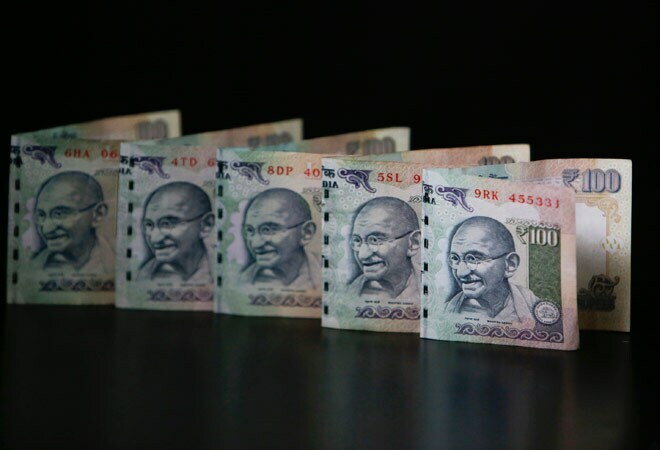 Under new provisions, individuals having exempt income without any ceiling (other than agricultural income exceeding Rs 5,000) can now file Form ITR-1 (Sahaj). 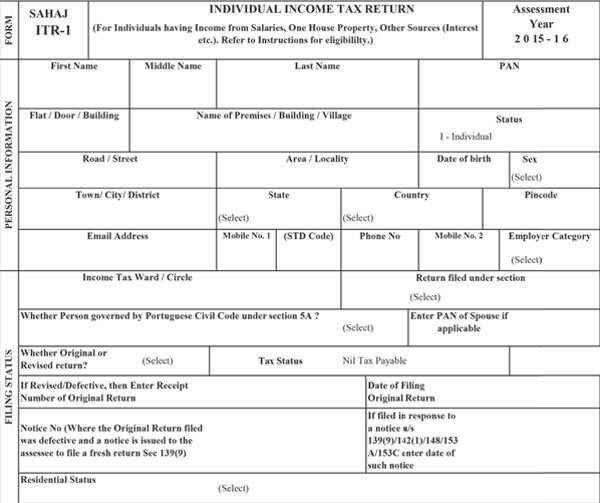 In another move, any resident individual earning income from outside India or having a financial interest outside India is not allowed to file the income tax return in ITR-1 from now. Earlier, after filing the return online you needed to post acknowledgment separately to the income tax offi ce. Now, under new provisions you no more need to post ITR-V if Aadhar number is provided in the ITR form. This could be a big relief for taxpayers.